Shower of Roses: Advent Preparations & A Jesse Tree Ornament Swap! So, who else is thinking ahead and making plans for Advent and Christmas? With my younger children out of town I have quite the list of little projects I am hoping to complete over the next week, including wrapping some of the Christmas gifts I had (thankfully) purchased throughout the year as well as wrapping up books for this year's Advent & Christmas Book Baskets and St. Nicholas Day! 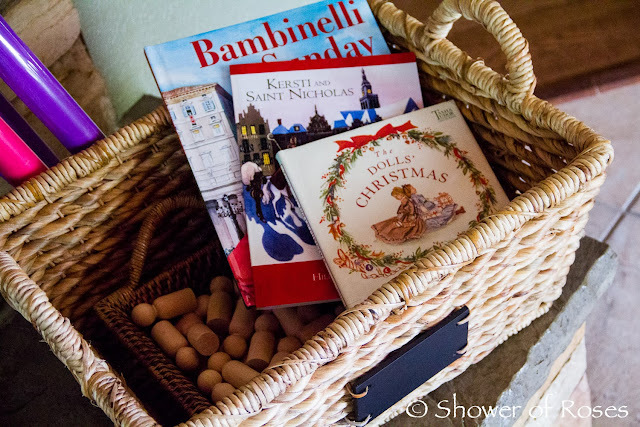 I'll try and post a complete list sometime, but my new picks for this year do include those pictured in the basket above: Bambinelli Sunday (a newly published book by Amy Welborn), Kersti and Saint Nicholas (written by Hilda van Stockum, originally published in 1940 and reprinted in 2010! ), and The Dolls' Christmas (OOP, I finally found an inexpensive used copy earlier this year!). I am also going to be making some little "Angel" ornaments for a Jesse Tree Swap which Karen generously offered to host this morning on Facebook! We will still use our original well loved felt Jesse Tree, along with our beautiful set of Jesse Tree Treasures Ornaments, but I am very excited to add a handmade set to our collection as well! If you are interested in joining the swap go sign up now! I started planning two weeks ago:) With a new babe due during Lent, I am getting all our liturgical plans in order to make it easier. Thank you so much for your posts! I am getting GREAT ideas. God Bless. Continued prayers for your family during these challenging, yet blessed, times. "To my three little daughters, the real authors of this book, and to St. Nicholas with apologies"
And..Ive been wanting to order Francie on the Run and The Mitchells, also by Hilda Van Stockum! We have those too and have been planning to read them! Hopefully soon! I love Tasha Tudor and some of her books always end up wrapped for Christmas. The Dolls Christmas has always been so expensive, I was delighted to see a less expensive copy that you linked to! Oh good! It looks like such a precious book! I have a couple other Tasha Tudor books to wrap up this year as well! Our oldest received the version of Secret Garden illustrated by Tasha Tudor on her birthday and I have Inside the Secret Garden A Treasury of Crafts, Recipes, and Activities to give her on Christmas in addition to The Tasha Tudor Cookbook! I've been looking over "Christmas Mosaic" by Cay Gibson for some book ideas/study guides/activities, etc. There are some great finds in her book (despite some being hard to find or OOP). I'm looking forward to YOUR book list for this year and seeing what else is new for your Christmas book basket this year! Wow! Thanks for including our book in your basket! Thanks for another great book, Amy! I pre-read it and can't wait to share it with my children. I'm sure they are going to enjoy it this Advent! I made a Jesse Tree inspired by this blog and I'd like to show you how this turned out. I think I asked you this before but I can't remember your answer. Do your children really think it is St. Nicholas who leaves them the treats? I have been letting mine think it is St. Nick, however my oldest seems a little wary. Here in Colombia it is Baby Jesus who brings the Christmas gifts. Would you mind sharing?Thanks! Oh Jessica! You shouldnt have! Thats so thoughtful of you! Thank you! That was helpful. My older sister said that when we were little my mom did not push Santa, but rather was quiet and let our imaginations work. And the main focus was Christ's birth. I love the idea of showing our children the miracles that can happen and keeping the wonder and excitement of Christmas. And how beautiful our Catholic faith is that we always have the contrasts of fast and feast. I also remember our mother making an effort to bring us to Mass more during Advent.. God bless!